As many of you know I am waging war on aging. In my early 50's and I'm not a big fan of what time and gravity are doing to my skin! I try many products and let all of you know which ones I like and have the best results with. Are you having trouble with your eye area? Have fine lines? Wrinkles? Puffiness or dark circles? 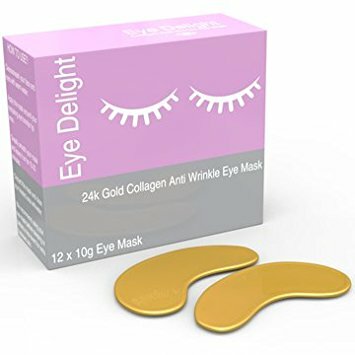 You should try Eye Delight 24k Gold Collagen Disposable Eye Care Pads. It comes in a box of 12 eye pads, and they are easy to use. After you've washed your face apply the eye mask to the eye area ( or you can use them at the lip area) let them sit for 15-20 minutes. These pads actually stay in place without slipping or sliding around. Then remove the pads and discard them, and rinse your skin. Your eyes will look hydrated and glowing. You can use these before bed or before a special night out. The combination of hyaluronic acid, gold and collagen is a wonderful combination to restore the eye area to it's former glory. With extended use fine lines, wrinkles and dark circles diminish.